Sliding sideways is where we slide sideways with respect to the direction the skis are pointing in, and is used a lot in skiing, as soon as you can use it properly. What a lot of people don't realise is that they have been sliding sideways since they managed to get their skis parallel with stem turns, just not so much. As was explained in creating resistance having your skis sideways to your direction of travel gives the most resistance possible. This means that if we come across a steep slope that we want to ski down slowly. Sliding sideways will give us the most control over our speed, and enables us to go down the slope the slowest. Sliding sideways is mostly used to go down a slope in a very steep traverse. This makes us able to put a lot less turns in on a steeper slope than if we were traversing right across the slope in between every turn. When we use sliding slideways for a steep traverse, the skis still stay relatively sideways to the slope, but we travel diagonally with respect to the direction that the skis are pointing in. 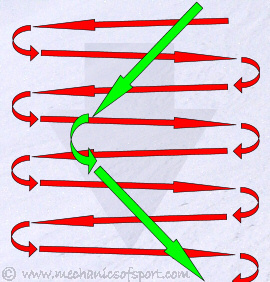 The diagram on the left shows a possible route down a slope using sliding while traversing in green, compared the route that would be taken if we did not let the ski slide sideways as we traverse in red. 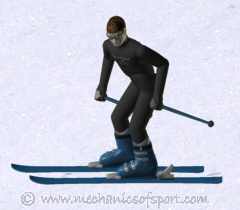 The position for sliding sideways is mostly the same as for traversing (as described in the stem turn), with the skis parallel and hip width apart. Weight over the downhill ski, and in the middle of the ski lengthways, but with the body facing more down the slope as that is the direction you are going. If we slide completely sidways straight down a slope, we must have our weight in the middle of the ski. To go forwards and backwards across the slope while sliding the weight is just moved slightly forwards or backwards so that the skis start to drop slightly in whichever direction (longitudinal weight distribution). If you are trying to go sideways but are going slightly forwards or backwards, all you need to do is lean the opposite way along the skis slightly, which should bring your weight to the middle of the ski, making you slide sideways. To speed up or slow down while sliding sideways, you either lean further up or down the slope. Leaning down the slope brings the skis flatter to the slope so that the edges don't push into the snow so hard (edge pressure). This makes the edges provide less resistance, and you will speed up. If you want to slow down, you need to lean further up the slope slightly, this makes the edges dig into the snow more, creating more resistance and slowing you down. The movement to lean up or down the slope to control you speed is only a very small movement. In the sideways direction you do not have a very wide stance, and the body only needs to move a few centimetres to make a big difference. If you are trying to slide sideways but are not actually sliding, the chances are that you are not leaning down the slope enough. Many skiers are too afraid to lean down the slope enough to slide sideways properly, even with such a small movement needed they can struggle to find the confidence. 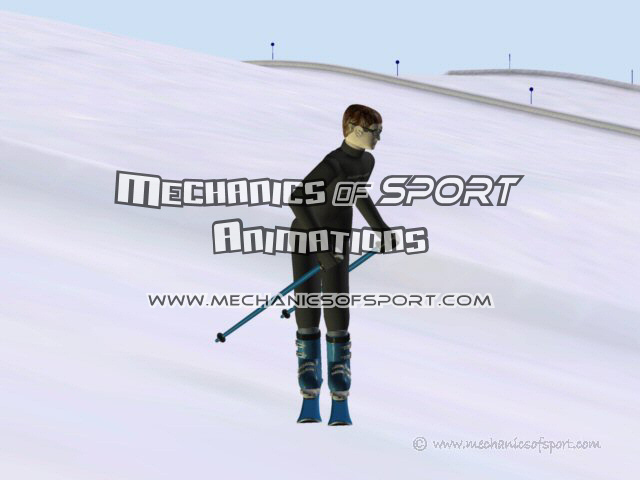 The animation shows the 3D skier speeding up and slowing down while sliding straight down the 3D piste. Then the camera angle changes and he leans forwards so that he goes forwards slightly, brings his weight back to the middle, to go sideways again, then leans back, to go backwards slightly, finishing up with his weight in the middle so that he is going sideways again. Not leaning down the slope enough - To slide sideways only requires a small movement to lean down the slope, but people are often very afraid of doing it. 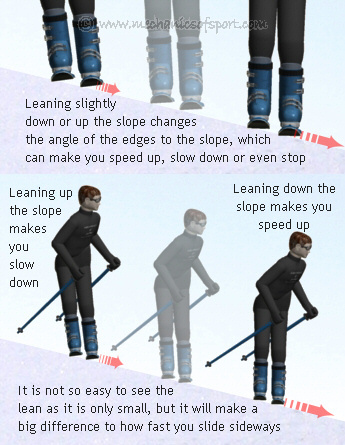 Making to bigger movements along the length of the skis (longitudinally) - Sliding sideways only takes small movements to control, and if the movements are made to big, the skis can turn a long way into the fall line making you pick up speed and it harder to bring the skis back to sideways. Not turning the upper body to look down the slope enough - A lot of people stand looking straight along the skis, the body needs to be turned down the slope so that you can see where you are going, and it also makes it easier to lean down the slope. More general common mistakes can be found in the Common Mistakes page of the Learning to Ski section. When practising to slide sideways at first, it is best to use a slope that is not too long and out of the way so that you are not in the way of other people. The slope needs to be reasonably steep too or you will find that there is too much resistance to slide sideways properly. Taking ski lessons will introduce you to skiing exercises based on how people learn to ski in real life, so that you learn to slide sideways with the correct technique. On to the Parallel Skiing section. Some of the positions shown in the diagrams on this page may have been exaggerated to make the leans and weight changes easier to see. If you would like to know more about this please read the Exaggerations page.